Swedish construction, mining and industrial equipment manufacturer Atlas Copco has been named the world’s most environmentally-friendly industrial company by US magazine Newsweek. 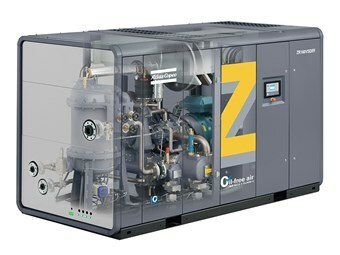 Atlas Copco ZR 160 VSD FF compressor with Variable Speed Drive. The annual Newsweek Green Rankings analyses the world’s 500 largest publically-traded companies and assesses them on environmental and sustainability indicators such as the ratio of energy and water use to production output, waste minimisation and factors such as percentage of total revenue derived from ‘green’ sources. Atlas Copco was ranked first in the industrial category and 11th overall. The award adds to the company’s impressive green record, with Atlas Copco’s policies on climate change being recognised by the United Nations at its Business and Climate Summit in May. The company says environmental sustainability is a core tenet of the business. "Making innovative, energy-effective products and taking other steps to reduce the environmental impact is about business leadership," Atlas Copco corporate responsibility vice president Mala Chakraborti says. "Our environmental targets are central to our business, and we are happy to be recognized for this." Along with its production methods, Atlas Copco’s products also have a reputation for being energy-efficient. In 1994 the company pioneered the variable speed drive (VSD) for compressors, which drastically reduced energy consumption for compressors by allowing the unit’s engine speed to be adjusted to the level required for the job, eliminating excess energy use. Prior to this, compressors generally operated at either full power or no power, even though most jobs required something in between. In 2013 Atlas Copco launched VSD+, an update that cut energy consumption by a further 30 percent. The company says machines using the VSD+ technology can cut energy use by more than 50 percent when compared to traditional compressors. Click here to view the entire Newsweek Green Rankings list. Click here to find Atlas Copco equipment for sale. Click here to look up Atlas Copco equipment specifications.